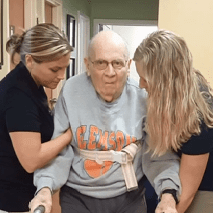 Cletus had not walked for over 3 years! Thanks to his efforts in conjunction with our Physical Therapy team, Cletus is now walking over 20 feet! We are very proud of him, and look forward to even more success.